Hair is an important feature of every person’s appearance. As all knows, choosing perfect hair products for your hair type is the key to beautiful hair. L’Oreal is a popular brand of cosmetics and they have a wide range of hair products for men, women and even kids. 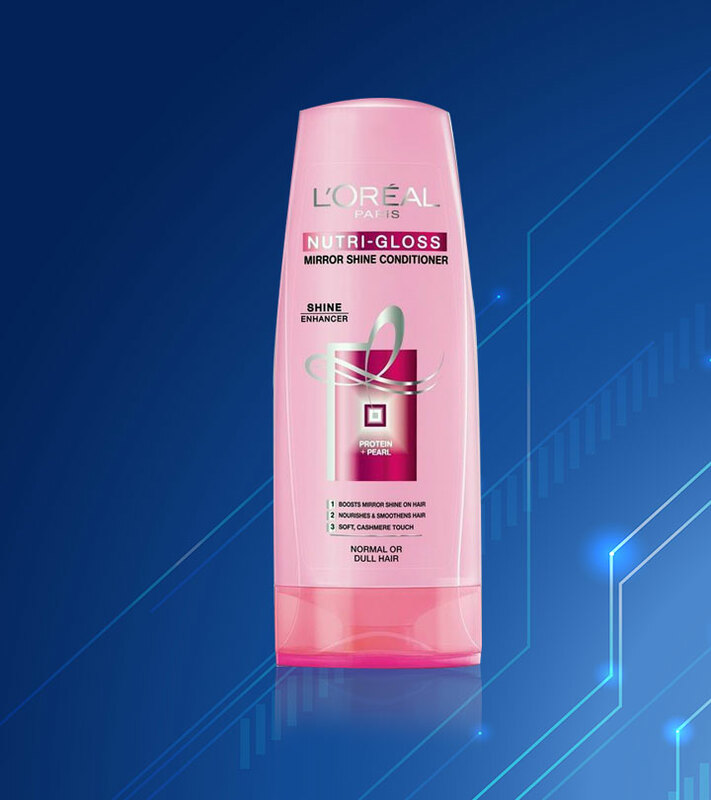 Loreal hair products like the shampoos and conditioners are the most frequently used by people and because of this, L’Oreal concentrates more on launching shampoos and conditioners of different types to capture all people’s attention. 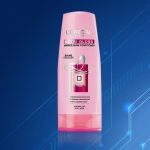 But Loreal India hair products are not just about shampoo’s and conditioners, they also produce a wide variety if luxury products that allow women to pamper themselves at home. Here are some of their very popular products. Products from this nutrigloss range are specially formulated for dull hair types to bring back the shine to hair with pearl protein ingredient. This range claims to give a mirror shine and casmere look to hair. The Nutri-gloss Mirror Shine shampoo works in nourishing and illuminating hair with its pearl ingredients and also acts as a shine concentrate on your hair. No new claim, the conditioner also work on the same basis as the shampoo does. If you’re looking out for a shampoo and conditioner for your dull or normal hair, this might be your pick. This is a tempting range for women who often colour their hair. Colour protect formula contains active nourishing ingredients and hand filters that work on two levels. It nourishes the hair and transforms it to give that silky touch and helps protecting hair fiber from external aggressions and accentuates your colour’s radiance. This range includes mainly two products, one is the colour protect repairing shampoo and another one is the repairing conditioner. These two products are a boon to women who loves to colour their hair but fears of losing it by shampooing. Are you a person who love hair colours? Then these products from L’Oreal Colour Protect range become your love too. By now, you all would have been introduced to the total repair by commercial ads and magazines. So, this total repair hair range works to protect 5 signs of hair damage such as Hair Fall (due to breakage), Dryness, Roughness, Dullness and Split Ends. 5-in-1 benefits! As same as the color protect and total repair ranges, this total repair range mainly includes the shampoo and conditioner. This range has a repairing masque as well. Who wouldn’t love to take a try? This range has many hair products that are specially formulated for kids. These shampoos and conditioners come in various designed colorful bottles of cartoon and toy shapes to attract the kids. Their smells are sweet, fruity and floral to grab kids attention and all the products from this kids range are safe and gentle on kids hair. Which kid wouldn’t love toy shaped shampoo bottles or sweet smelling shampoos? 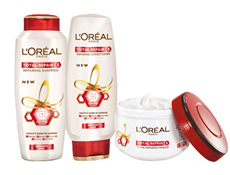 It’s not a surprise for women to know that L’Oreal Paris has a huge range of hair products. We have all always known that but did you also know that L’Oreal also has a number of masques and other spa products that ca be used at home to pamper ourselves. So lets discuss them now! Continue your personal hair-spa experience with this sensory massage service, after the sensory system 1 shampoo. 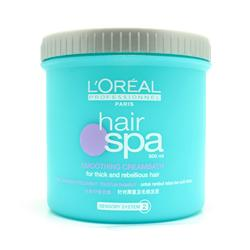 This smoothing formula is based on purified water, catatonic smoothing agents and glycerin, to help control volume. The hair is soft, easy to manage and shiny-from root to tip.”These are the promising claims of this product. Go for this one if you love to keep your hair soft and manageable, it is for sure going to work. Is your nose sensitive? Then it’s a big no-no. For a pocket friendly home spa experience, this hair cream works best and you get a huge quantity for the affordable price too. What more you want? Dry hairs will love and stick to it. Masques are hair favorites. Isn’t that true? After a long dry sunny day or a no maintenance week, our hair craves for nourishment. Masques are the perfect alternate to hair oils to bring back the shine and softness of the hair. This L’Oreal total repair hair masque claims to repair the 5 signs of hair damage such as hair fall, dryness, dullness, split ends and roughness. Wow! Isn’t that super great? This is a five in one masque to bring back your lustrous hair. Unlike the hair smoothing hair creams, this doesn’t smell odd, but the excess chemical content might bother you. Choose this masque for a refreshing feel and a smooth hair of course! Is your hair frizzy all the time? Do you notice a lifeless dry look on your hair every time? This hair serum is for you then. The brand claims that this serum is a featherweight conditioning leave-in serum that works on the most difficult frizz-prone hair, leaving a perfectly polished finish. It contains Reflexium technology a mixture of active shine ingredients and taming agents designed to coat the hair surface with a light protective film. Tempting claims for dry unmanageable hair and they almost do justice as well. So, go for it to get that shiny conditioned hair. 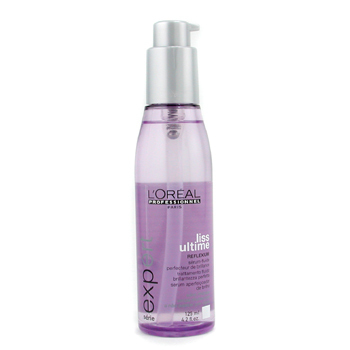 It might be not on the pocket for some, but still a great working hair serum from L’Oreal. So girls, which is your most favorite hair product from L’Oreal? Loreal is one of the most loved brands in India and abroad. Here is a list of the best loreal hair care products that you can find in the Indian market. Looking for the perfect conditioner? Here is a list of the best loreal conditioners that will make your search a lot easier.